Wrap me up in blini and let the games begin. Russian lamb kebab with tomato-prune sauce. Recipe here. It's like a cheese-filled pancake. Recipe here. Thinly sliced cucumber and radishes mixed with spring green onions, sour cream, and fresh dill. Recipe here. Beef and beet soup. Recipe here. Russian potato salad named after the French Chef, M. Olivier who created it. Recipe here. Great for Russian tea. Recipe here. Ground beef mixed with boiled rice or buckwheat wrapped in cabbage leaves. Recipe here. Beef, barley, and pickle soup. Recipe here. Potato dumplings in chicken broth. Recipe here. Stuffed bread. This one has roasted onions, caraway seeds, and Swiss cheese. Recipe here. Beef and mushroom stew over egg noodles. Recipe here. Mulled honey drink. Recipe here. 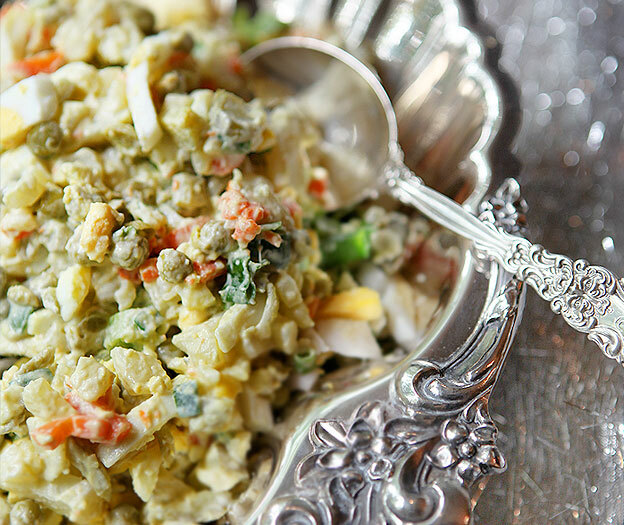 Dressed herring salad. Recipe here. Try them on little blini topped with cream. Recipe here. On toast with onion-capers salad. Recipe here. Russian meat dumplings. Recipe here. Recipe for Tolstoy Tang, Moscow Mule, and Mango Siberian Sunrise here.